From the lows of a near fatal broken neck to the highs of a 7 Summits world speed record and beyond, this is Steve’s story. Saturday December 13th, 2014, Steve Plain was rushed to hospital with a broken neck after being dumped in a wave at Cottesloe Beach, Western Australia. Doctors said he was extremely lucky to be alive, but were unsure if he’d walk again. Refusing to accept doctors prognosis, Steve set himself a goal. Fast forward a few years. Steve is not only back on his feet, but has recently completed the most ambitious challenge of his life, climbing the world’s 7 Summits, the highest mountain on each of the seven continents, in under 4 months. Or what he called, “Project 7in4”. Along the way, Steve raised awareness and funds for the Surf Life Saving Association and SpinalCure Australia. From the lows of a broken neck, to the highs of the world’s tallest mountains, this is Steve’s story. 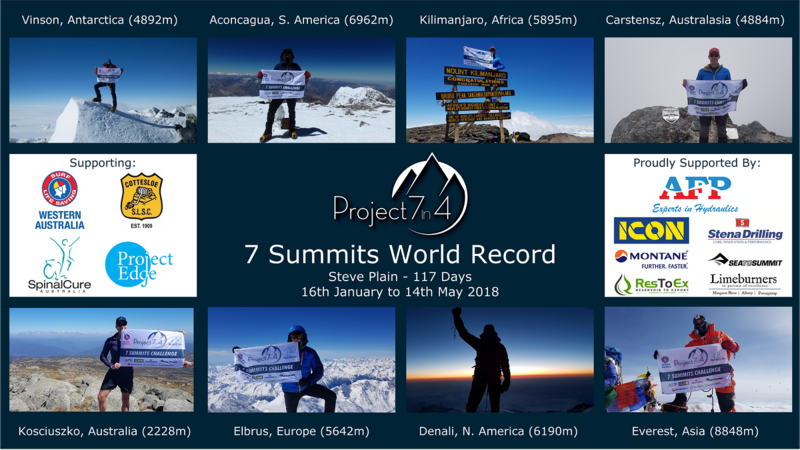 On 14th May, 2018, Steve concluded Project 7in4 reaching the summit of Everest and setting a new 7 Summits world speed record of 117 days, 6 hrs and 50 mins. Thank you to all have have supported Project 7in4, in particular, Jon Gupta and Tanya Plain. In recognition of his 7 Summits world record expedition, Steve was honoured to be named “Australian Adventurer of the Year” at the Australian Geographic Society 2018 annual awards. Are you looking for a keynote speaker for your conference, business function or school event? From overcoming a broken neck to climbing the highest mountain on every continent in world record time, Steve’s story demonstrates how ordinary people can achieve extraordinary results through commitment, resilience and hard work. Entertaining, inspiring and occasionally painful, Steve will take you with him step-by-step along his journey.